Beloved Bay-area bands Journey and Steve Miller, along with soul/funk R&B group Tower of Power, opened their 40-city North American tour in May and discount tickets continue to fly at the top of national concert queues, said Marta Ault at online discount ticket marketplace, BuyAnySeat.com. The Bay-area behemoths perform in Burgettstown, Noblesville, Quebec, Cuyahoga Falls, Clarkston, Maryland Heights, Tinley Park, Kansas City, Denver and Salt Lake City next. Beloved Bay-area bands Journey and Steve Miller, with R&B group Tower of Power hit Burgettstown, Noblesville, Quebec, Cuyahoga Falls and Clarkston next. Some folks look north to Cleveland and Detroit for the birth of rock music in the 1950s. Others look south to Memphis. But most, like longtime rocker Steve Miller for example, would agree that San Francisco in the 1960s and 1970s was indeed the “Fertile Crescent” of the genre’s evolution. Wherever the origin, rock continues to, well, rock and roll. Furthermore, there’s no question that Steve Miller and his crew, along with current tour co-headliner Journey, are two of the most influential Bay-area rock bands in history. In fact, from 1976-82, the duo helped power rock to the top, selling more than 20 million albums in the process. In addition, the tandem helped transform and expand the sound of rock; and they consistently topped the charts with nearly 20 Top Ten hits over that span. “Journey and the Steve Miller Band’s early success has now translated into long, productive careers for both groups. They’ve already made waves during one coast-to-coast run," said Marta Ault at online discount ticket marketplace BuyAnySeat.com. "And with nearly 20 shows still on tap, we’re proud to offer fans the most complete and continually refreshed selection of discount concert tickets available online, with a Worry-Free Guarantee to protect their purchase,” added Ault. Journey has sold more than 80 million albums worldwide since the band’s formation in San Francisco in 1973. The Diamond-certified group also owns 19 Top 40 singles and 25 gold, platinum and multi-Platinum albums. While Journey has been a major player in the arena rock scene for decades, the band's fame was recently resurrected in the states during the San Francisco Giants’ World Series run in 2012. The ball club picked the band’s ‘80s monster hit "Don’t Stop Believin" for its anthem as they charged towards another championship. Journey has recorded numerous hits including "Wheel in the Sky”, "Faithfully" and "Any Way You Want It" among many others. “Don’t Stop Believin” propelled the band to global stardom and is the top-selling catalog track in digital history with over six million digital copies sold. Until recently, it was also the best-selling rock song in digital history until it was surpassed by Imagine Dragons' "Radioactive" in January 2014. However, "Don't Stop Believin" still stands as the top-selling song from the 20th century on iTunes. The band's 2011 World Tour was one of their most successful ever after drawing nearly a million fans, and was also among the top 15 that year in terms of ticket sales. In 2013, Journey toured four continents and performed to more than half a million fans. Journey shares their hometown with tour mates The Steve Miller Band, who first broke big in the ‘70s with hits "Space Cowboy", "Take the Money and Run" and "The Joker”. 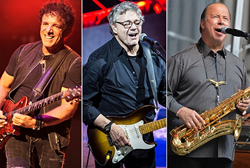 One of rock music's all-time greats, The Steve Miller Band’s signature blues-rock sound has made the group one of classic rock’s defining artists, especially with more than 30 million records sold in a career spanning over 40 years. In addition, 2009-2012 marked four of the busiest, most productive years in the long, illustrious career of Miller and the band. While “Wide River” in 1993 was Miller’s only studio release of new material between 1988 and 2010, the group released “Bingo!” in June of 2010, a successful assortment of blues covers. “Let Your Hair Down,” a companion release to Bingo hit 10 months later in April 18, 2011. To shop for discount Journey and Steve Miller Band tickets, visit BuyAnySeat.com. To save to even more, enter coupon code "BAS2014" during checkout. About BuyAnySeat.com: An online discount ticket marketplace, BuyAnySeat.com connects sports, theater and other live entertainment fans to an extensive worldwide network of ticket sellers. The site’s simplified listings and navigational tools enable fans to easily locate, compare and purchase inexpensive, discounted or lower-priced tickets to virtually all advertised sports and entertainment events around the globe. The online marketplace, which is PCI-compliant and Norton Secured, also provides customers with a complete Worry-Free Guarantee on all ticket purchases. Based in Denver, Colorado, BuyAnySeat.com is a subsidiary of Denver Media Holdings. For more information, please visit http://buyanyseat.com.